With a 4.0 GPA and several college-level courses under her belt, Maria Stroukoff had her pick of undergraduate engineering programs. The Oklahoma high school senior was accepted at seven of the eight schools to which she applied. Yet when decision time rolled around, just one stood out: George Washington University’s School of Engineering and Applied Science. “I could tell from the first day that I wouldn’t be a number,” recalls Stroukoff, who had shown up without an appointment and immediately was paired with an adviser for a personal tour of GW’s downtown Washington, D.C., campus and hours of fielding questions. The warm welcome for Stroukoff was no coincidence. 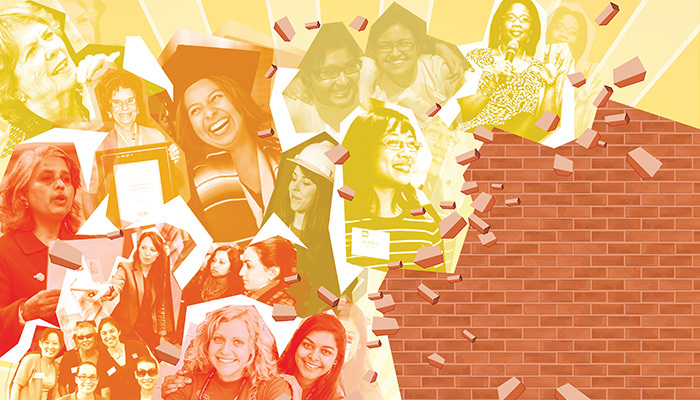 GW is among a dozen or so engineering schools that are graduating unprecedented numbers of women after overhauling everything from admissions to instruction. While the average share of females in engineering programs in the United States has hovered at under 20 percent for three decades, women make up 39 percent of GW’s engineering student body. At North Carolina State University (NCSU), women now make up a quarter of engineering students, up from 18 percent just five years ago. The University of Toronto has made similar gains, with women making up a record 30.6 percent of first-year engineering students. Southern Methodist University’s Lyle School of Engineering has seen the number of female students more than double in the past decade to currently represent nearly a third of the class. And Harvey Mudd College made history last spring by graduating an engineering class with more women – 56 percent – than men, a first for the school and the nation. Another common denominator of successful programs is an emphasis on experiential or project-based learning. As a junior in electrical engineering at GW, for example, Stroukoff took four classes during her last semester, “and every one of them had a lab, from programming to soldering hardware.” It was a stark contrast to the previous semester in South Korea, where her coursework was much more theoretical. “It made me appreciative of the environment I get to learn in,” she says. Faculty at Michigan Technological University’s College of Engineering, where the proportion of women enrolled has climbed by more than 30 percent since 2009, credit their first-year Engineering Fundamentals with fostering an environment in which women feel grounded and connected. For the past ten years, students in the program have been scheduled in cohorts, so they learn with the same group for at least two classes, as well as work collaboratively on team projects. “Studies show that women seek more community attachment,” says the school’s first-year chair, Jon Sticklen, citing a 2009 Journal of Engineering Education paper, “Women Engineering Students and Self-Efficacy,” which notes that a sense of inclusion can help women succeed in engineering. Klawe attributes the engineering program’s culture shift in part to the prevalence of female professors, who number six out of a total of 20 faculty. “It makes a huge difference for female students to have role models, [to see] that it’s possible to have a career and combine it with having kids,” she explains. “That says women belong here.” Bhagirath Narahari, associate dean for undergraduate engineering programs at GW, where 19 of 86 tenure and tenure-track faculty are female, agrees there’s a “strong correlation” between an increase in women faculty and recruitment of more female students. The University of Toronto, where three of the four new engineering faculty hired for this academic year are women, offers a case in point. As ASEE’s research has shown (Prism Databyte, November 2014), having more female faculty doesn’t always correlate with higher graduation rates for women, particularly in disciplines that traditionally attract more females. Still, notes one recent graduate, having women engineering professors instilled confidence and made her “want to be like them.” Stroukoff hasn’t had any female professors this year and wishes there were more. “Having circuit theory taught by a woman would be really cool,” she says. requirements. But more critical to the school’s success, says computer science professor Lenore Blum, was institutionalizing funding for its Women in Computer Science program, rather than relying on grants and the school’s popular summer program for Advanced Placement computer science teachers. Despite the bright spots, engineering educators admit that gender parity remains a long way off. Female faculty members are still few and far between, though not for a lack of trying. “Frankly, really great female faculty can write their own ticket,” says Christensen. “I wish we could do more.” Moreover, Orwin notes, the percentage of women in the tech workforce has been falling since its peak in 1989. Still, she’s hopeful that the next generation, nurtured in a far more supportive environment than she was, will “force change” on campus and beyond. Margaret Loftus is a freelance writer based in Charleston, South Carolina.